Big sales like this one, which let you take 15% off your new subscription at Little Passports* don’t come around all that often. Use the code HAPPY5 at checkout to take a big chunk of the total price away! 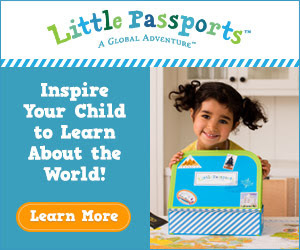 Little Passports is a wonderful monthly subscription all about travel and different cultures around our world that shows up in your mailbox with dozens of activities to keep your child occupied like fun games, puzzles and a big colorful world map! Isn’t that a much better alternative to having them just watch tv? Check out the Little Passports Blog for more fun learning opportunities like this amazing Recycled Tin Can Robot that you can make with your kids and maybe even get them started with a subscription of their own once you see the value and most of all, the FUN involved!